The most common question that I am asked by friends, relatives, and visitors is “why can’t Israel and the Palestinians live together in Peace”? This region has suffered turmoil for thousands of years often centering on religious issues. The conflicts within Judaism, Christianity and Islam can be as strident as those between the groups in our region. 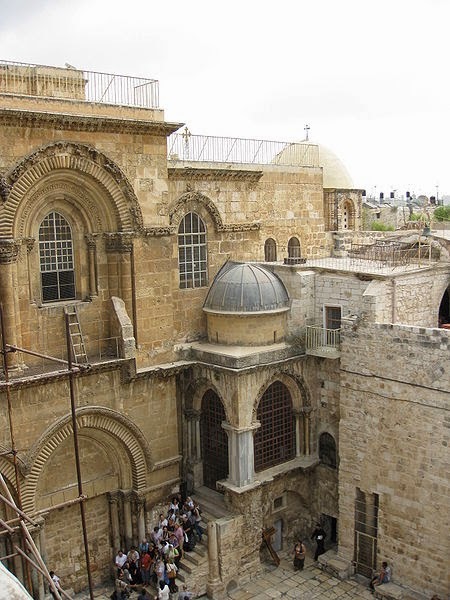 This is the first of two posts describing the Church of The Sepulcher, which is considered the most holy site in Christianity; and the Western Wall, the most revered shrine in Judaism. Both sites are located in Jerusalem “The City of Peace”. I frequently visit the holy city which is just two hours from my home in Haifa. These sites are microcosms of the challenges of the faiths to build unity from within. I am writing this post as we celebrate the visit to Israel of Pope Francis, who is coming to primarily build harmony within Catholicism and Christianity. Jerusalem is one of the oldest and most controversial cities in the world. The City of David is holy to the three major Abrahamic religions, Judaism, Christianity and Islam. During its four thousand year history, Jerusalem has been destroyed, besieged, attacked, and captured numerous times. Walls were built around the city under Suleiman the Magnificent. Today those walls divide the Old City, into four parts —known as the Armenian, Christian, Jewish, and Muslim Quarters. As I walk the streets of the old city sometimes it is hard not to get lost but easy to see the differences between the communities. The Old City is home to many sites of religious importance, among them the Temple Mount and its Western Wall, the Church of the Holy Sepulcher, the Dome of the Rock and al-Aqsa Mosque. The Church of the Holy Sepulcher is venerated as Golgotha (the Hill of Calvary), where Jesus of Nazareth was crucified and is said also to be buried (the Sepulcher). The church has been for Christians the most important – pilgrimage destination since at least the 4th century, as the site of the resurrection of Jesus. The first Christian Emperor, Flavius Constantine, ordered the building of the church in about 325. During the building of the Church, Constantine's mother, Helena, is believed to have rediscovered the True Cross, and the tomb of Jesus. Constantine's church was built as two connected buildings which included the great basilica of Golgotha, and a rotunda, called the Anastasis ("Resurrection"), which contained the remains of a rock-cut room that Helena and Macarius identified as the burial site of Jesus. This building has endured much damage and upheaval. It was razed by fire in 614 ad when the Sassanid Empire, invaded Jerusalem and captured the True Cross. It was restored in 630 by the Emperor Heraclius when he recaptured and rebuilt the church. In 1009, Fatimid caliph Al-Hakim bi-Amr Allah ordered the complete destruction of the church as part of a general campaign against Christian places of worship in the region. The damage was extensive, with few parts of the original church remaining. 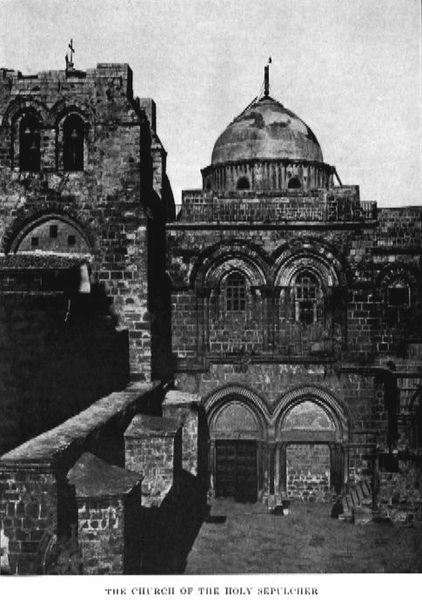 In negotiations between the Fatimid and the Byzantine Empire in 1027-8, an agreement was reached to allow the rebuilding of the Church, which was completed in 1048. The new construction concentrated on the rotunda and its surrounding buildings: the great basilica remained in ruins. Control of Jerusalem changed hands several times until the arrival of the Crusaders in 1099 who regained control. The crusaders refurnished the church in a Romanesque style and added a bell tower. These renovations connected the small chapels on the site and were completed in 1149, placing all the Holy places under one roof for the first time. The church became the seat of the first Latin Patriarchs. The church was lost again to Saladin, in 1187. Emperor Frederick II regained it in the 13th century, while he was under a ban of excommunication, leading to the curious result of the holiest church in Christianity being laid under interdict. The entrance to the church is through a single door. This narrow access to such a large structure has proven to be hazardous. For example, when a fire broke out in 1840, dozens of pilgrims were trampled to death trying to escape. The cobblestone streets and walkways around the church are very narrow and slippery. On several occasions I have fallen or been bumped by the throngs of excited visitors. Near the altar is a stairway climbing to Calvary (Golgotha) traditionally regarded as the site Jesus' crucifixion and the most richly decorated part of the church. The main alter contains The Rock of Calvary (12th Station of the Cross). Beneath the altar there is a hole said to be the place where the cross was raised. Due to its significance, this is the most visited site in the Holy Sepulcher. Near the altar there is a statue of Mary, believed to be working wonders. The Rotunda is located in the center of the Anastasias. In the Rotunda is the chapel called the Aedicule, which contains the Holy Sepulcher. The Aedicule has two rooms, the first holding the Angel's Stone, which is believed to be a fragment of the large stone that sealed the tomb; the second is the tomb itself. The Church of the Holy Sepulcher is so complex and fascinating that I have only mentioned some of the major sites within this incredible spiritual center. The primary custodians or the church are the Eastern Orthodox, Armenian Apostolic, and Roman Catholic Churches, with the Greek Orthodox Church having the most responsibilities. Times and places of worship for each community are strictly regulated in common areas. Failure to follow the schedule often results in major disputes. Establishment of the agreement known as the status quo did not halt the confrontations, which continue to break out even in modern times. One time, on a hot summer day in 2002, a Coptic monk moved his chair from its agreed spot into the shade. This was interpreted as a hostile move by the Ethiopian Congregants, and eleven were hospitalized after the resulting fracas. Under the status quo, no part of what is designated as common territory may be rearranged without consent from all communities. This can lead to the neglect of badly needed repairs. Another example of this state of affairs is a wooden ladder placed over the entrance of the church in1852, when the status quo defined both the doors and the window ledges as common ground. This ladder, the "Immovable Ladder", remains there to this day, in almost exactly the original position. To this day no church controls the main entrance. Two Muslim families share custody of the entrance. Is there hope for harmony in The Middle East? Pope Francis is coming here to commemorate the 50th anniversary of an historic meeting in Jerusalem between Pope Paul VI and the then-spiritual leader of the world's Orthodox Christians, Ecumenical Patriarch Atengora. That meeting resulted in significant progress toward better Church relations. Catholics and Orthodox have been divided since the Great Schism of 1054, precipitated largely by disagreements over the primacy of the pope. Pope Francis will be joined in Jerusalem by the current ecumenical patriarch, Bartholomew, who became the first ecumenical leader to attend a papal installation since the schism when he travelled to Rome for Francis' inaugural Mass back in March. They will celebrate Mass together at the Church of the Holy Sepulcher. Hopefully, this can be an example to all in the region that dialogue can replace confrontation to resolve differences and bring hamony. I would like to add a comment to my own post. The event did occur and was applauded by many in the world. Will more unity within Catholicism and Christianity plus other faiths come from this event? Let us hope that will be the case. Just an FYI - the holiest spot for the Jews is actually the temple mount, not the western wall..... Temple mount is where the two Jewish Temples stood, the western wall is simply a creation by Herod (the heretic) to hold up the temple mount that he expanded..... Its holiness is only due to its proximity where the temple stood, the western side where the where the holy of holy's part of the temple was..